Today I will touch on the familiar debate over skeuomorphism versus flat design. Skeuomorphism was popular when the iPhone first came out in 2008 because it instilled familiarity of the physical objects such as the calculator in a digital environment. People related well to this design trend at first as it was a great way to ease them into using touch devices such as smartphones. However, we got used to seeing the fake leather and torn paper and the high-gloss icons. And almost started to get annoyed with it. We knew how to use the smartphones so why saturate our senses with drop shadows, gradients, 3D and all that glossiness? It just seemed like overkill. 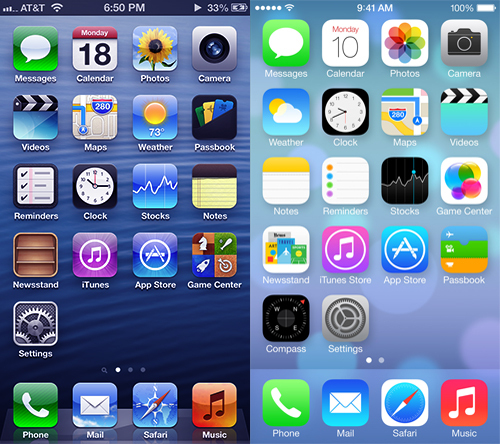 That’s why Apple introduced the all new flat look of iOS7 in September 2013. But is skeuomorphism completely out of the picture? The Apple iWatch seems to use more of this design trend for the same reason as the first iPhone; to instill familiarity by resembling its interface to the traditional watch. I would love to know what you think of this! Should skeuomorphism come back in all its glory? Or should there be a balance of both trends? Can print designers do web?